Ok this is my official first blog! Woo Hoo! I will mainly be posting new photography updates and photos about my business. I will try my hardest to post several times a week but I’m not making any promises. Ok this is not photography related . . . my first post in my photography blog and it’s not photography related. On another note it is. There is a photo involved, but its of me. So i ran the Country Music Marathon last Saturday. Boy I don’t think i have ever felt so much pain. It was a breeze until mile 10. Those last 3 miles were killer. Anyways I made it, along with several friends and family and it felt amazing! 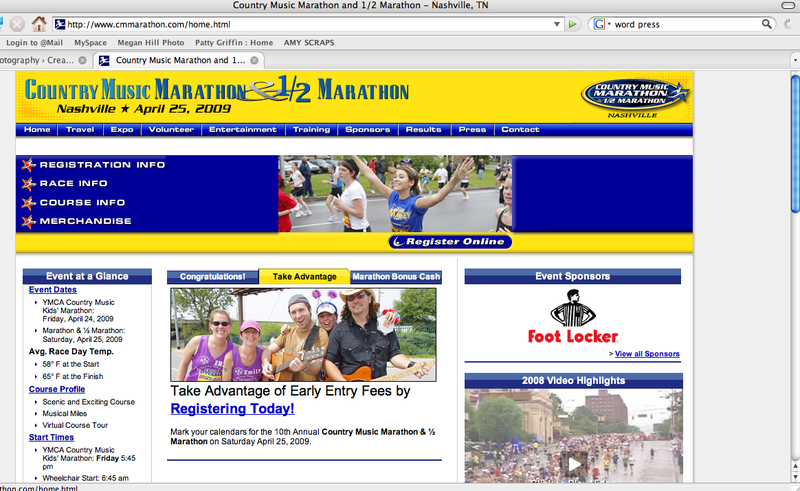 So anyways, several people informed me today that my photo was on the main page of the http://www.CMMarathon.com website. Wow. Why me out of 30,000 people. Someone gave me the advice to pose for the cameras- well i did and look where it got me! =) Make note . . . this photo was taken before mile 10. Alright until the next post. Sweet! You can totally see “Dave Ramsey” on your shirt. Love your new blog! I can’t wait to see your photos! ok, so forgive me, but at first, i couldn’t figure out why you were wearing a fuzzy antenna headband. Way to go. This will be a great way for me to keep up. How will I know when you have a new “posting”?